Solar thermal panels are referred to by a number of different names such as Solar Water Heater,Solar Hot Water Panel, Solar Hot Water Collector,Solar Thermal Panel or Solar Thermal Collector.These terms all describe the same generic device. Solar water heaters work by absorbing sunlight and converting it into usable heat. A simply analogy is to think about a dark coloured object sitting in the summer sun. Over time it can become very hot from absorbing the sunlight. Solar water heaters work in the same way but using materials that are specially designed to maximise the efficiency of that absorption. High quality absorber coatings, as used by Greentek products, are able to absorb up to 95% of the energy in sunlight throughout the full spectral range (PV only absorbs a portion of the spectrum). Below is an example of a quality absorber from coating manufacturer Tinox that absorbs 95% of available sunlight, and only radiates (emits) about 4% of the absorbed energy as heat. The key areas to look at are the yellow which represents solar radiation and the light blue which is how much of that sunlight is absorbed by the coating. 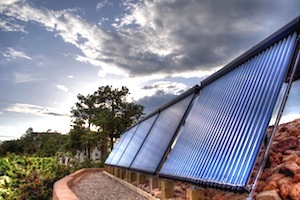 Solar water heaters can therefore reach efficiencies that are consistently more than 4 times higher than PV panels.